Here our customers write about their experience with Porta Holiday - on the purchase, sale and long term rental in Mallorca. Your opinion is important to us! Write to us, and let us know if you were satisfied with our service. We look forward to your feedback. 4 ★★★★★ Rating for Rental of a Finca in Campanet. Excellent stay in this area of the island but house difficult to heat in the winter time. 3 ★★★★★ Rating for Rental of a Finca in Ariany. 3 ★★★★★ Rating for Rental of a Ferienhaus in Can Picafort. Alles am rechten Platz und ein geeignetes Winterhaus! Mein bester Freund und ich, wollen im Sommer wiederkommen. 5 ★★★★★ Rating for Rental of a Ferienhaus in Maria de la Salut. 5 ★★★★★ Rating for Rental of a Finca in Muro. 5 ★★★★★ Rating for Rental of a Ferienhaus in Cas Concos. 5 ★★★★★ Rating for Rental of a Ferienhaus in Tolleric. 3 ★★★★★ Rating for Rental of a Villa in Alcudia. 4 ★★★★★ Rating for Rental of a Villa in Can Picafort. 5 ★★★★★ Rating for Rental of a Villa in Felanitx. We liked our stay, it eas very good for our needs. The price was ok.
4 ★★★★★ Rating for Rental of a Ferienhaus in Puig de Ros. 4 ★★★★★ Rating for Rental of a Ferienhaus in Font de Sa Cala. Wir haben unseren Familienurlaub auf Mallorca in dem Ferienhaus Casa Colosia verbracht und sind rundum zufrieden. Die Schlüsselübergabe lief problemlos ab, so dass wir in aller Ruhe in einen erholsamen Urlaub starten konnten. Es hat der ganzen Familie super gefallen. Wir freuen uns schon jetzt auf unseren nächsten Finca-Urlaub auf Mallorca. Danke auch an Porta Holiday. 5 ★★★★★ Rating for Rental of a Ferienhaus in Selva. Für uns als große Gruppe perfekt, war alles da was man braucht und viel Platz! Ruhige Lage und nah am Meer. Wir kommen gerne wieder! 5 ★★★★★ Rating for Rental of a Finca in Alcudia. 5 ★★★★★ Rating for Rental of a Finca in Pollensa. Wir waren das erste Mal auf der Insel und wollten eine typische Finca um in das mallorquinische Leben reinzuschnuppern. Dafür war das Haus Santa Magdalena geeignet da Sie all unseren Ansprüchen entsprach. Nicht so einfach bei der Riesenauswahl an Fincas. 5 ★★★★★ Rating for Rental of a Finca in Inca. How quick Top Villas were at replying to all queries. When we had problems with not having any hot water, you were very quick to act and we appreciated that a lot. 3 ★★★★★ Rating for Rental of a Finca in Alcudia. The amount of space. Each bedroom had its own en suite and plenty of little seating areas meaning that even with so many people, you could still find space on your own. 4 ★★★★★ Rating for Rental of a Finca in Font de Sa Cala. Schöner Außenbereich, hell und alles da was man braucht! Einfach aber sehr gut. Der Fön ging am 2. Tag kaputt aber das wurde schnell und durch sehr nette Mitarbeiter geregelt. Wir werden mit Sicherheit wiederkommen. 5 ★★★★★ Rating for Rental of a Wohnung in Cala Ratjada. Very nice property. Owner was there to help on arrival and she was lovely. The villa was well equipped. Our only real gripe was the construction noise from 07:30 - 19:00 every work day from a nearby property - not the owners fault I know but it meant we went out more than use the pool. 3 ★★★★★ Rating for Rental of a villa in . House lived up to expectations overall. Very clean. Good support during holiday (had issue with electricity which was solved quickly). 4 ★★★★★ Rating for Rental of a Ferienhaus in Alcudia. 4 ★★★★★ Rating for Rental of a Ferienhaus in San Lorenzo. La cadre et environnement . Le calme . La terrasse et la piscine . 5 ★★★★★ Rating for Rental of a Finca in Manacor. 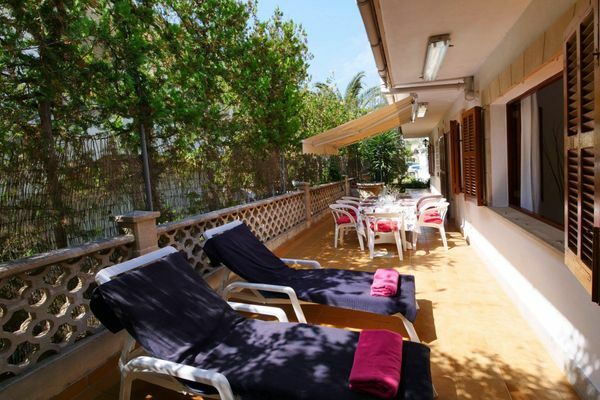 Overall this villa was spacious, comfortable and ideally placed for shops, beach and sightseeing. It is preferable to have a car for travelling to other resorts. It is in a lovely peaceful area overlooking the sea and I really loved waking up to the view each morning. I didn't mind that there was no outdoor pool as we had 3 young children and we would not have been able to relax if we had to worry about them wandering and falling into the water. So we had a very relaxing peaceful holiday at this property. We had a lovely stay at this Finca. Very homely and set in beautiful gardens. Very private and not overlooked at all. Son Servera has everything for your basic needs and it was easy to bustaxi into the local coastal resorts. Both Sandrine and the owners were very helpful and friendly. We would love to return one day. 5 ★★★★★ Rating for Rental of a finca in . 4 ★★★★★ Rating for Rental of a in . Tolle Küche, alles da was man braucht. Ruhig gelegen aber wenn man ein Auto hat ist die Lage top da es sehr mittig auf der Insel liegt. 5 ★★★★★ Rating for Rental of a Finca in Sencelles. Wir kommen schon viele Jahre nach Mallorca und die Ecke im Norden Richtung Osten um Capdepera ist einfach toll. Daher war für uns direkt klar das Haus Aguila passt perfekt. Und so war es auch wir hatten einfach eine schöne Zeit und haben richtig die Seele baumeln lassen. 5 ★★★★★ Rating for Rental of a Finca in Capdepera. The pool and outside area. 4 ★★★★★ Rating for Rental of a Finca in Selva. Sehr schönes Haus mit tollem Garten und Pool. Wir waren mit der ganzen Familie da und können nur sagen das wir sehr glücklig mit unserer auswahl sind. Der Pool und der Garten wahren ideal für den Spaß unserer Kinder und der Strand ist auch leicht zu erreichen. Wir kommen bestimmt nochmal wieder. Porta Holiday Rating 4.63/5 by 160 testimonials. you are reading: Testimonials · Porta Holiday Rating 4.7/5 by 123 testimonials.